After record breaking heat in the summer of 2011, many of us, including me, did not expect much in the way of “color” in the fall. However, we were pleasantly surprised and had a very colorful fall – one of my favorite seasons. 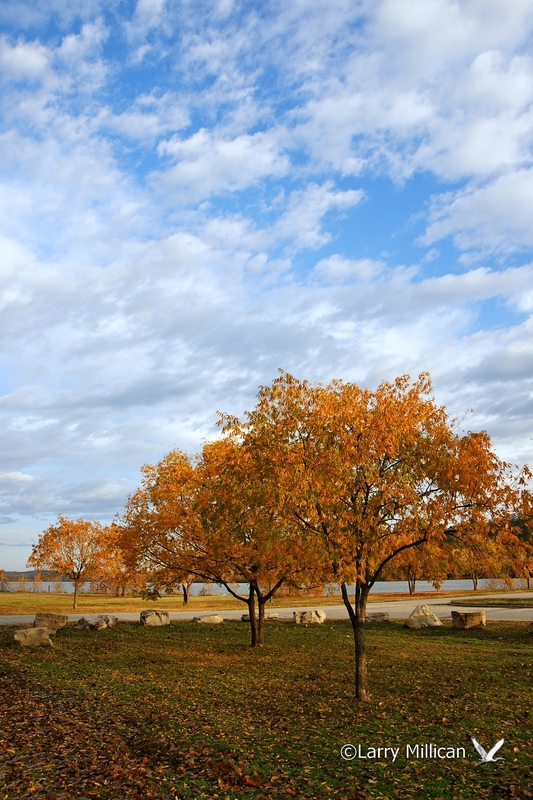 Autumn in Arkansas and Oklahoma is brief, and each year brings a different look. Occasionally, as in 2009, we’ve had an unusually wet fall, giving us water falls, and flowing streams to complement the color. But, more often, it’s a relatively dry season. It’s a time of change, and a photographer is challenged to be at the right place at the right time to make an image to represent the season. On this morning, I was driving to work, but had left home early enough to stop if I saw the right scene, in pleasant light. Here’s one image I stopped to make. Initially, I pointed my camera toward the just-risen sun, but that wasn’t the image I wanted. So, I turned around, and saw the clouds, the sky, the yellow leaves, and the tree line. What you see here, was shot as a RAW file, cropped slightly to rid the image of a light pole on the right, and some pavement on the left. Using Corel After Shot Pro, and Corel Paint Shop Pro X4, I’ve adjusted color balance, levels, and sharpness. Camera was the Sony Alpha 700, with a Tamron 17-50 f/2.8 lens. Exposure was 1/250 sec. at f/5.6, ISO 200.